Last year the Mental Health Foundation received thousands of stunning entries for the Photo-a-day Challenge and loved seeing nature through our eyes. The Photo-a-day Challenge was so popular last year they’re doing it again this year. It will run for 15 days from 1–15 October! Head out into nature, look at it with fresh eyes and show everyone what you see! I was lucky enough to be a part of the UCE Kathmandu New Zealand Social Enterprise Challenge this week, hosted by the UC Centre of Entrepreneurship (UCE). Coming into the competition, I had very little knowledge of social enterprise and the role businesses having an impact play in our world today. In August we competed regionally against UC and Ara teams, and after winning the Canterbury Regionals we went through to the National Challenge. The National Challenge started on Sunday, where we came up against teams from Wellington, Auckland and Dunedin. We had 48 hours to develop a social enterprise with a focus on Wellbeing. We met on Sunday afternoon for a briefing from the UCE team and to meet the other teams – let the challenge begin! We started our brainstorming and ideating to come up with a solution to the wellbeing challenge that had real social impact, and also dove into our Kathmandu goodie bags! Monday was a full-on day with two mentoring sessions, idea development and pitch practice. It was great to get feedback on our ideas from other people, which led to multiple changes for each team. Tuesday consisted of finalising our enterprise ideas and getting ready for final pitches. 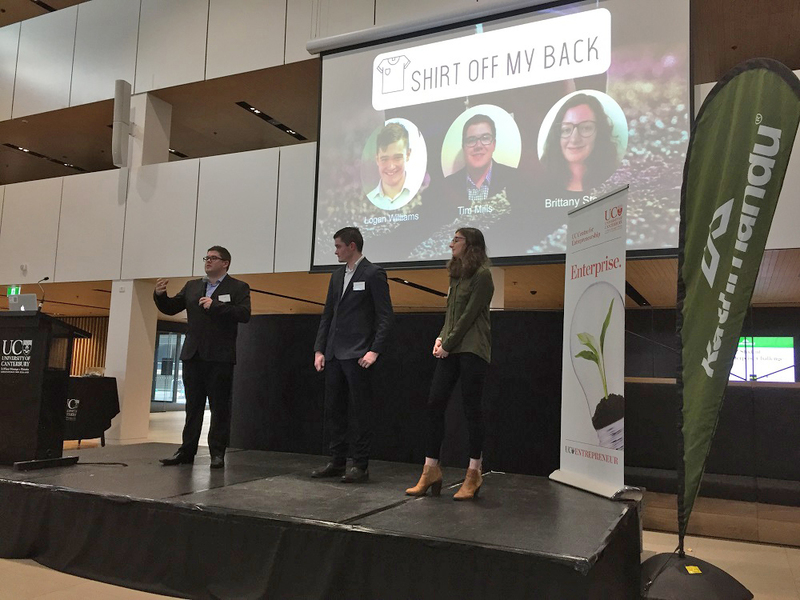 The finale of the challenge was held in the Engineering Core foyer, where we pitched our idea to a panel of five industry judges, as well as our peers, mentors and other guests. It was really valuable to be able to bounce ideas off each other as a group and mini-community. After a pretty hectic 48 hours, it was awesome to be able to attend the Social Enterprise World Forum from Wednesday to Friday. This was part of our prize for winning the Regional Challenge. The Forum has been an amazing opportunity to be in the presence of some of the most innovative minds in the social enterprise space. Make sure you have a ‘good one’ and register your party on the Good One party register. Why register your party with the Police you ask? Sometimes no matter how much planning you put in and bags of chips you buy, parties can go pear shaped. If this does happen it is much easier for you to get help from the community Police when you know who they are and they know you. And if it helps you get your bond back at the end of the year we reckon it’s worth it! Or, dive right in and register a party now! The Good One community project recently won the Excellence in reducing harm from crime award at the national finals of the Police Evidence Based Problem Oriented Policing Awards. Where UCSA President James Addington accepted the award on behalf of the Good One Project Group.